The primary role of the police is to prevent crime, not catch criminals, the chief inspector of constabulary for England and Wales has said. Tom Winsor said focusing on would-be offenders, likely victims and potential crime hotspots would save taxpayers' money and keep more people safe. But "primitive" technology is limiting officers' ability to do that, he added. 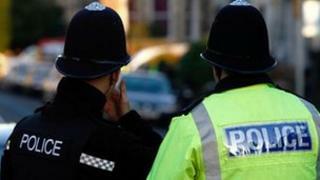 The Police Federation said budget cuts and a focus on targets had left forces less time for proactive street patrols. Mr Winsor outlined his ideas in a speech to security think tank the Royal United Services Institute (RUSI) on Monday. He said crime prevention was "the primary purpose of policing" and, with regard to persistent offenders in particular, officers must "make it as hard as possible to commit the crime in the first place". Resources should be targeted at "crime hotspots", used to identify "repeat and vulnerable victims of crime" and find out where the "most prolific and persistent and dangerous offenders in the community" were located. Tom Winsor's approach to the police appears to have changed. The man who sparked anger among officers when his government-commissioned review called for fitness tests, direct entry for outsiders and lower starting salaries is now more of a critical friend. The greatest asset of the police, Mr Winsor said, was its people; officers and staff needed to be "nurtured" to realise their potential; and their successes "too often" went unnoticed. He identified two ways in which police were let down - by out-dated equipment they'd been issued with, such as bulky mobile electronic devices, and the reluctance of other agencies, particularly health workers, to take responsibility for people who may be at risk of committing crimes. The new chief inspector of constabulary is more on their side than rank and file officers probably realise. But to do this, he said officers needed access to much better technology, ideally a smartphone-like device so each individual could hold "force intelligence in his hand". "It is remarkable that the technology available to the police, particularly in their interaction with other parts of the criminal justice system, is as rudimentary and as primitive as it is. It haemorrhages efficiency. "The frustrations, the screaming frustrations, of frontline police officers who struggle with outdated and antiquated systems is a considerable matter of importance." Police budgets are being cut by the government, but Mr Winsor said forces had "to do more with fewer resources" and focusing on prevention offered "the biggest bang for the public's buck". But he also insisted crime prevention was "not the sole obligation of the police". "It is the obligation of every citizen and that includes the other agencies and emanations of communities and the state. "Prevention is also an obligation of health professionals, particularly in the field of mental health where undiagnosed or untreated illness can, as we know, lead to the commission of serious violent crime." Mr Winsor said the biggest greatest frustration cited by officers was dealing with individuals with mental health problems. The police were relied on as the service that "will never say no", he added, but other bodies must do more. Steve White, vice-chairman of the Police Federation of England and Wales, which represents rank-and file-officers, said it would work with Mr Winsor to establish how his ideas would be realised. Media captionTom Winsor: "The primary purpose of the police is the prevention of crime"
"However, politicians and the public should be mindful of the fact that preventative policing is both resource-intensive and often very difficult to measure," he said. "Falling budgets and an emphasis on statistics and targets have resulted in officers having less time to carry out proactive patrolling on our streets than at any point in the past." Deputy Chief Constable David Zinzan, of the Association of Chief Police Officers (Acpo), meanwhile, said Mr Winsor's comments were "very significant". "The reality is that police forces are having to operate on a reduced budget and will have to do so in the future so, if we can prevent crime happening, that's going to be good," he told BBC Radio 5 live. "Most of the criminal justice costs occur post-defence." He said police prevented more crime by targeting "crime generators - particularly drugs" as well as "hotspot locations, certain licensed premises and individuals who actually have a propensity to commit crime". "Long-term problem solving" included working with local authority planners in the design of new developments such as sport stadiums and housing, he added. "We can prevent the design and building of buildings that will actually act as crime generators in the future," he added. Mr Winsor's comments were welcomed by charity Victim Support. His speech came as another think thank, Policy Exchange, recommended introducing a modern version of the "Tardis" police box - made famous by Dr Who - to allow people to report crimes, provide witness statements. "These would be technologically-enabled police contact points featuring two-way audio-visual technology so that members of the public could communicate directly with police staff," the report said. The report also suggests replacing police stations with "cops in shops". A Home Office spokesman said decisions about the most effective use of resources "including the number, location and operating hours of police stations" were a matter for chief constables and police and crime commissioners. Acpo said: "We need to think differently to equip policing for the years ahead, identifying and sharing what helps - be it 'cop shops', public contact booths or special constables and volunteers complementing the way we patrol communities." Mr Winsor is a lawyer and former rail regulator with no background in policing and his appointment as chief inspector last year was a controversial choice. In March 2012, he published a report for the government recommending wide-ranging changes to police pay and conditions, including cutting the starting salary for police constables in England and Wales to £19,000 - a reduction of £4,000. What do bobbies learn on the beat?